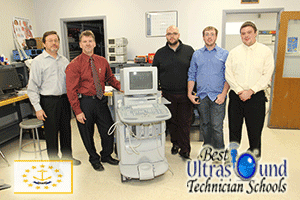 A hospital and two-year college provide accredited ultrasound technician programs in Rhode Island. The name of the hospital is Rhode Island Hospital, which collaborates with the state's oldest institution of higher learning (Rhode Island College) through its School of Diagnostic Imaging. The other institution is the Community College of Rhode Island (CCRI), which joins Rhode Island College as one of the three public schools of higher education in the state. The hospital is located in Providence, Rhode Island's capital and largest city, while the college is based in Lincoln. Their programs are fully accredited by the Commission of Accreditation of Allied Health Education Programs (CAAHEP). The program at Rhode Island Hospital consists of a four-year Bachelor of Science curriculum in medical imaging, with a concentration in diagnostic medical sonography. Students spend the first two and a half years at Rhode Island College, taking general education requirement and cognate courses. The remainder of the four-year curriculum comprises clinical training at Rhode Island Hospital, in addition to The Miriam Hospital and Women & Infants Hospital. By comparison, Community College of Rhode Island has an Associate Degree in Applied Science program in Diagnostic Medical Sonography, which lasts two years and is administered at the institution's Flanagan Campus. Sixty-five credits are required for graduation from CCRI's program. Included in the curriculum are general, vascular, and echocardiography practicums, which consist of three units each. The U.S. Bureau of Labor Statistics (BLS) reported in 2012 that diagnostic medical sonographers in Rhode Island had a median annual salary of $75,200, or made $36.14 per hour. This is higher than the national median for that year, which was $65,900 ($31.66 per hour). The bottom 10 percent of Rhode Island earners in the sonography field took home $62,500 ($30.07 per hour), while the top 10 percent earned $94,600 ($45.49 per hour). The BLS reported that there were around 330 diagnostic medical sonographers working in Rhode Island, a number that is expected to increase by 30 percent (to 430 professionals) between 2010 and 2020.